PLOT NO.31, PHASE II, CENTRAL ROAD, M.I.D.C., ANDHERI - EAST, MUMBAI 400093. All reservations must be guaranteed by a valid credit card at time of the booking. * Rates are quoted on a per room per night basis. 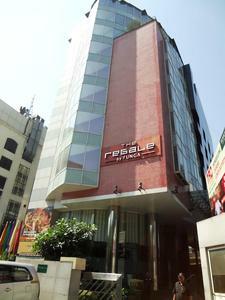 * Room rates are subject to 10% Luxury Tax and 7.416% Service Tax on applicable rate. * Child below 12 years of age can be accommodated free of cost in the parents room without any extra bed. Child above the age of 12 years is considered as an adult and will be charged as per applicable extra person/bed charges. * Maximum occupancy per room is two adults plus one child. * Room availability and rate may be subject to change if amendments are made to a confirmed booking. * This offer cannot be used in conjunction with any other programmes. * Hotel Check-In time and Check-Out time is 12:00 Noon, any early check-in or late check-out will be subject to availability and will be charged accordingly. * In case of any dispute, the hotel reserves the right to make final decision. Any cancellation within 48 hours prior to arrival will be charged one night room charges as a penalty. In case of any late cancellation or guest not checked-in, hotel reserves the right to charge the credit card an equivalent of one night’s stay charges including taxes. Early departures may attract retention charges. All reservations must be guaranteed by a Visa or Master Credit card. The hotel reserves the right to pre-authorise credit cards prior to arrival. Important: A recent Government notification requires guests to carry proof of identity at the time of check in. The proof of identity can either be the guests passport, driving license, PAN card or voters card. Any cash payments above INR 25,000 would require PAN card copy for Indian nationals only.